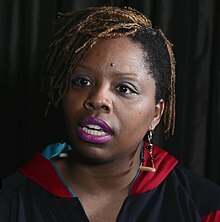 Patrisse Cullors (born 1984) is an American artist and activist. Cullors is a noted advocate for prison abolition in Los Angeles and a co-founder of the Black Lives Matter movement. She also identifies as a queer activist. Cullors was born in Los Angeles, California. She grew up in Pacoima, a low-income neighborhood in the San Fernando Valley. She became an activist early in life, joining the Bus Riders Union as a teenager. She later earned a degree in religion and philosophy from UCLA. She teaches at Otis College of Art and Design in the Public Practice Program. She also teaches in the Master's Arts in Social Justice and Community Organizing at Prescott College. For me, seeking spirituality had a lot to do with trying to seek understanding about my conditions—how these conditions shape me in my everyday life and how I understand them as part of a larger fight, a fight for my life. Along with community organizers and friends Alicia Garza and Opal Tometi, Cullors founded Black Lives Matter. The three started the movement because of frustration over George Zimmerman's acquittal in the shooting of Trayvon Martin. Cullors wrote the hashtag #BlackLivesMatter to corroborate Garza's use of the phrase in making a Facebook post about the Martin case. Cullors further described her impetus for pushing for African-American rights as stemming from her 19-year-old brother being brutalized during imprisonment Los Angeles County jails. Cullors credits social media as instrumental in revealing violence against African Americans, saying: "On a daily basis, every moment, black folks are being bombarded with images of our death ... It's literally saying, 'Black people, you might be next. You will be next, but in hindsight it will be better for our nation, the less of our kind, the more safe it will be." Cullors has served as executive director of the Coalition to End Sheriff Violence in L.A. Jails. The group advocated for a civilian commission to oversee the Los Angeles County Sheriff's Department in order to curb abuses by officers. By organizing former jail inmates as a voting bloc, the group hoped to sway the Los Angeles County Board of Supervisors to create such a commission, as well as gather enough votes to elect a replacement for Los Angeles County Sheriff Lee Baca, who resigned in 2014 for separate reasons. However, the group did not succeed in its efforts. Cullors co-founded the prison activism organization Dignity and Power Now, which succeeded in advocating for a civilian oversight board. Cullors is also a board member of the Ella Baker Center for Human Rights, having led a think tank on state and vigilante violence for the 2014 Without Borders Conference. Cullors is a Fulbright scholar. She was named 2007 Mario Savio Young Activist of the Year. She has also received the Sidney Goldfarb award. She was named an NAACP History Maker in 2015. Also in 2015 Cullors, Opal Tometi, and Alicia Garza (as "The Women of #BlackLivesMatter") were listed as one of the nine runners-up for The Advocate's Person of the Year. She was also named a Glamour Magazine Woman of the Year 2016. Also in 2016, she was named one of Fortune's World's Greatest Leaders and an Honorary Doctorate from Clarkson University, among several others. She is the 2018 recipient of the José Muñoz Award from CLAGS: The Center for LGBTQ Studies at the CUNY Graduate Center. In 2014 Cullors produced the theatrical piece POWER: From the Mouths of the Occupied, which debuted at Highways Performance Space. She has contributed articles about the movement to the LA Progressive, including an article from December 2015 titled "The Future of Black Life"  which pushed the idea that activists could no longer wait for the State to take action, and called her followers into action by encouraging them to begin building the world that they want to see. Wikimedia Commons has media related to Patrisse Cullors. Her book, When They Call You a Terrorist: A Black Lives Matter Memoir was published in January 2018. ^ Goldhill, Olivia (November 15, 2016). ""We can feel sad, hurt, demoralized. But we can't give up": A Black Lives Matter founder on Trump's presidency". Quartz. Retrieved July 19, 2017. ^ Garza, Alicia. "Herstory". Black Lives Matter. Retrieved July 19, 2017. ^ a b "Queerness on the front lines of #BlackLivesMatter". MSNBC. February 19, 2015. ^ a b c Aron, Hillel (November 9, 2015). "These Savvy Women Have Made Black Lives Matter the Most Crucial Left-Wing Movement Today". L.A. Weekly. Retrieved March 30, 2017. ^ "Public Practice faculty Patrisse Cullors talks about co-creating #BlackLivesMatter". Otis College of Art and Design. Otis College of Art and Design. Retrieved January 18, 2017. ^ Farrag, Hebah H. (June 24, 2015). "The Role of Spirit in the #BlackLivesMatter Movement: A Conversation with Activist and Artist Patrisse Cullors". religiondispatches.org. ^ a b Guynn, Jessica (March 4, 2015). "Meet the woman who coined #BlackLivesMatter". USA Today. Retrieved March 7, 2015. ^ Segalov, Michael (February 2, 2015). "We Spoke to the Activist Behind #BlackLivesMatter About Racism in Britain and America". Vice. Retrieved June 2, 2015. ^ Gebreyes, Rahel (September 10, 2014). "Patrisse Cullors Explains How Social Media Images of Black Death Propel Social Change". Huffington Post. Retrieved June 2, 2015. ^ Sewell, Abby (April 14, 2014). "Activist battles L.A. County jailers' 'culture of violence'". Los Angeles Times. Retrieved November 6, 2015. ^ Hing, Julianne, "In L.A., Civilians Will Have Power Over Sheriff's Department", colorlines.com, December 15, 2014. ^ "Staff and Board". Ella Baker Center. ^ Beckman, Hank (January 19, 2016). "Black Lives Matter co-founder brings message to Naperville". Chicago Tribune. Retrieved July 12, 2016. ^ Wheaton, Sarah (August 20, 2015). "Black Lives Matter isn't stopping". Politico. Retrieved July 12, 2016. ^ The Mario Savio Young Activist Award. ^ "Person of the Year: The Finalists". advocate.com. November 5, 2015. Retrieved November 6, 2015. ^ "Glamour's Women of the Year 2016: Gwen Stefani, Simone Biles, Ashley Graham, and More Honorees". Galmour.com. Condé Nast. November 1, 2016. Retrieved January 18, 2017. ^ "Alicia Garza, Patrisse Cullors, and Opal Tometi". Fortune Magazine. Time Inc. Retrieved January 18, 2017. ^ "Commencement 2017". Clarkson University. Clarkson University. Retrieved January 18, 2017. ^ "LGBTQ Pride Month: A Conversation with Patrisse Cullors". www.gc.cuny.edu. Retrieved June 11, 2018. ^ "PATRISSE CULLORS – Power: From the Mouths of the Occupied". Highways. Highways Performance Space. Retrieved January 18, 2017. ^ "About Patrisse Cullors". LA Progressive. Retrieved March 30, 2017. ^ "The Future of Black Life". LA Progressive. December 31, 2015. Retrieved February 7, 2017. ^ Deahl, Rachel (March 31, 2017). "Book Deals: Week of April 3, 2017". Publishers Weekly. Retrieved October 9, 2017. Aisha K. Staggers, "‘Dignity and Justice’: An Interview with Patrisse Khan-Cullors", New York Review of Books, January 18, 2018.